LOS ANGELES— The 2018 NCAA tournament has revolved around one word— upsets. 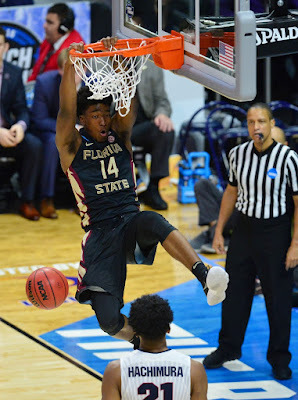 Another one occurred Thursday night at the Staples Center as the ninth-seeded Florida State Seminoles (23-11) shook up the bracket with a 75-60 win over the fourth-seeded Gonzaga Bulldogs (32-5). Record, pedigree and experience were all of the things the Bulldogs had on their side, but the Seminoles were not concerned as they came out in full attack mode. Things paid off early with a 23-11 lead and FSU coach Leonard Hamilton credited the hustle plays made as a main factor. “I thought we got off to a fast start because we got some deflections and some stops and got some easy baskets,” Hamilton said of the Seminoles’ start. Gonzaga countered with a 12-0 run, which tied the score at 23 with 6:54 in first half. The run was done with the help of several players— notably senior forward Jonathan Williams, who scored a layup then knocked down two free throws to follow. The absence of sophomore forward Killian Tillie, who was scratched from the lineup during warmups for Gonzaga was factor in the Bulldogs rough and patchy start. Ball security on offense was something both teams struggled with in the first half as FSU committed six turnovers, while Gonzaga accumulated seven turnovers. The errors from the Bulldogs allowed the Seminoles to score 11 points off of turnovers, which resulted in an 8-0 run to end the half with a 41-32 lead after 20 minutes. 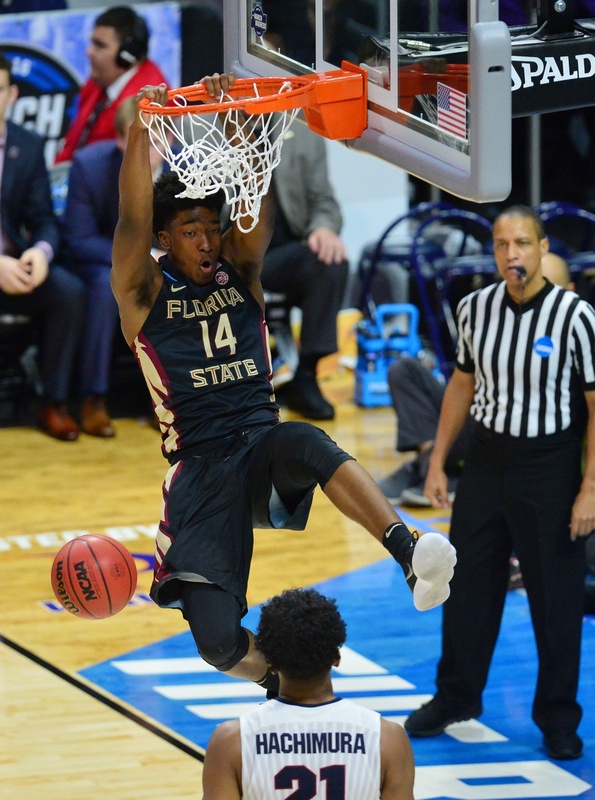 The momentum carried into the second half for FSU as junior guard Terrance Mann drove to the rim on the opening possession with a dunk on the fast break, which highlighted a game-high 18 points from the junior. Gonzaga played well for a few minutes and possessions at a time, but struggled putting a long streak together. The Zags short-lived streaks were due to the diligence and tenacity of the FSU offense and defense. Defensively they would strip, push and create breaks– making scoring hard and not allowing their opponents to get into any kind of groove. The Seminoles forced eight steals and did not give the Bulldogs any breathing room as they were held to 34 percent shooting. Freshman forward Mfiondu Kabengele was a defensive stalwart with four blocked shots as Hamilton felt like FSU was dialed in from the start. “But I thought our guys were dialed in defensively, and we got some good stops. I think we might have had nine blocks, eight steals, and each one of those possessions were critical. That gave us an opportunity to keep them at bay,” Hamilton said. There was a clear struggle on transition defense from the Zags, which allowed the Seminoles to get out and run on quick outlet passes. The plays helped widen the point disparity between the two teams as the Seminoles coasted past the Bulldogs as the Wolverines stand in the way from a trip to the Final Four. The Seminoles as they take on the No.3-seeded Michigan Wolverines (31-7) in the regional final on Saturday night (8:49 p.m., TBS).